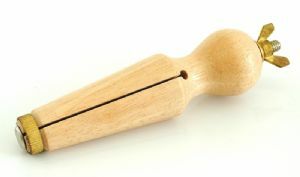 This jewellers clamp used for holding and securing rings or other small items in various positions while being worked on. Made from wood to hold work firmly but without marking it. Very easy to operate: The ring is placed around the end of the clamp and the wing nut at the base end. As the wing nut is turned the clamp expands to hold the ring securely in place. The clamp is released by turning the wing nut in the opposite direction.